Scrap Shotz would like to wish everyone a very Happy New Year! May 2010 be filled with good health, happiness and lots of scrappy time! 'Tis the season of giving handmade gifts to friends and family! I wanted to share this beautiful frame that Brenda made featuring her gorgeous granddaughter! I just love all the details in this one! Be sure to upload the photos of the gifts you made this season... I'd love to see them! Scrap Shotz would like to wish everyone a very Merry Christmas! May your day be filled with warmth, peace, joy and happiness! On the 12th day of Christmas, I would like to share a quick and easy wrapping idea. In my fabric stash, I found 2 metres of burlap - why I had it I can't quite remember!!!! 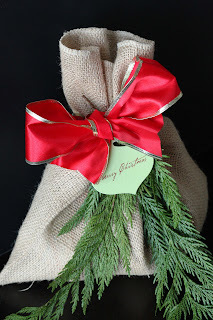 But I decided to sew a few burlap bags to use as gift bags. To embellish the bags, I used a die cut, a rub on, a bit of ribbon and some left over greenery from my front porch display. From start to finish, it was 10 minutes ... and that is what I like! "I've had this little take-out box sitting in my stash for a few years now, wondering what to do with it. Well, I'm giving my sister-in-law a piece of custom made jewelry for Christmas this year and wanted a cute, unique way to wrap it...and I remembered this little box. It literally took me 10 minutes to alter the box I had sitting on my desk using papers I had sitting on my desk from the December kit and a few other things. 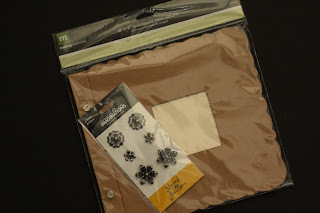 Instead of wrapping a box in wrapping paper, this year, why not use your supplies toquickly alter one? You'll be using up some of your stash and creating a one-of-a-kind package for someone special!" I am sure you'll agree with me that this is so adorable! Please let Heather know too! 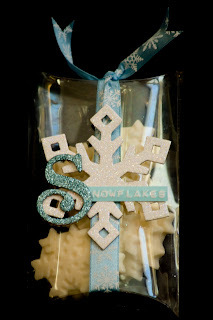 Do you spend a lot of time packaging up home made goodies to give as gifts during the holiday season? I do, because chocolates, almond bark and other goodies make wonderful little hostess gifts. This cute little project will package up your goodies beautifully and show off your hard work at the same time. This pillow box is made out of acetate and is so simple to make. Start by getting a pillow box template. You can google this and find a number of templates in various sizes so choose one that will suit your individual needs. I used a circle cutter or strong hole punch to cut half a circle out of one end flap on each side to facilitate easier opening. Adhere sticky strip or other very strong adhesive to the tabbed portion of the template and adhere (I like to put my sticky strip on the outside of the tab and adhere it to the other side so that the tab is now on the inside of the box. 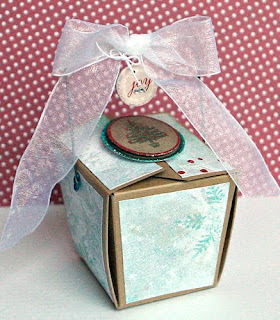 Fill your box with goodies and add ribbons and embellies as desired. 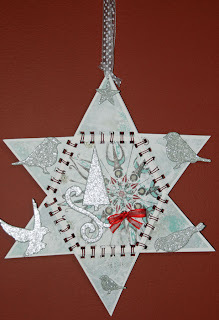 Here I’ve used some snowflake ribbon and a chipboard snowflake which I painted white and then added dazzling diamonds glitter on top while the paint was still wet. I then added a labeler sticker and a glitter alpha from December’s kit. ***It is very difficult to get nice pictures of clear objects but believe me when I say this looks really good IRL! I think it looks stunning Denise...and you can give me a gift any time! What do you guys think??? Please leave Denise a comment. Oh me oh my...Miss Amber has an extra special sweet day of inspiration for you! Make a sweet impression with your desserts this holiday season by adorning squares, cookies or cupcakes with adorable toppers! Simply search your scrapbook supplies for paper scraps, get out your holiday themed punches or diecutters and combine with a toothpick to create quick and easy toppers! Please let Amber know how darn sweet these cupcakes are in the comments section! Let's take a look in the gallery this week! Some of the ladies have been busy making some of the 12 Tags of Christmas! Gorgeous work ladies! These are a couple from Jillian... fabulous job on the techniques! And this one is from Tamara... love all the detail! Make sure you share your own tags if you've been playing along! I'd love to see them! "With the Christmas season upon us, inspiration is literally everywhere right now. It's definitely a delight for the senses. You can find inspiration in the wrapping paper and cards, advertisments, decorations, tableware, beautifully wrapped gifts, clothing, Christmas lights and even baking. Everywhere I turn, I see beautiful color combinations, amazing text work, cute images, and definitely BLING! The only thing that seems to be missing right now is some time. It is the busiest season of the year and time is at a premium for most people. However, even if I can't find the time to scrapbook right now, I can take pieces of that inspiration and make something homemade for someone else. 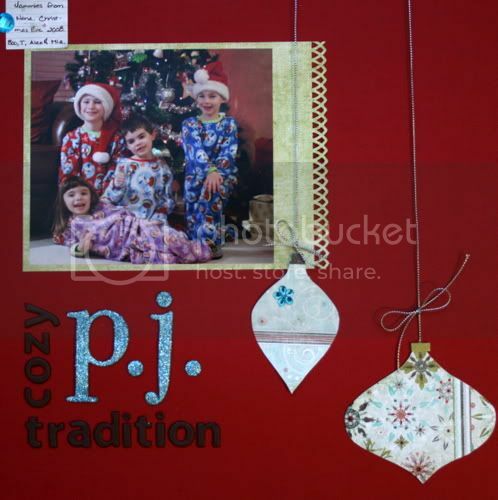 I couldn't resist taking this adorable tag off of a set of Joe pajamas that I gave away this year. Isn't it cute?! I couldn't resist using it on a card, adding a little bling, some rub-ons and a popping it up for some dimension. As for all those other ideas filling my mind right now, I'm filing those away in my idea book for January when the cold weather is here to stay and my life returns to the normal semi-crazy pace I'm more used to, which means I might have a little bit more time to scrapbook. We all know I'll certainly have a whole lot more photos then too." I think you will agree with me that this card is fabulous! Please let Heather know too! Ooooh...today we have a lovely keepsake ornament from Wendy. 1. Cut patterned paper (PP) to 5 1/2" x 5 1/4"
* Cut the sides to create a a hexagon - you will be making 6 cuts. 3. Now cut 3 squares measuring 3"x3". Cut each squares on the diagonal to create 2 triangles for a total of 6 triangles. * Mark the mid-point on the 5 3/4" side, approximately 2 7/8"
* Cut along the lines to create a hexagon - you will be cutting 6 times. create 2 triangles. There will be a total of 12 triangles. 7. Glue the PP hexagon to one of the white cardstock hexagons. Make sure the PP is centered inside the cardstock hexagon. 8. Glue one PP triangle to one cardstock triangle. Make sure the PP is within the CS triangle. Repeat 6 times. 11. For each triangle put a piece of foam tape at the points between the CS triangle and the PP triangle to add dimension. Repeat 5 times. 12. Punch a hole in the top. Add ribbon to hang and decorate as desired. Thank you Wendy for sharing this beautiful project! Please let Wendy know too! 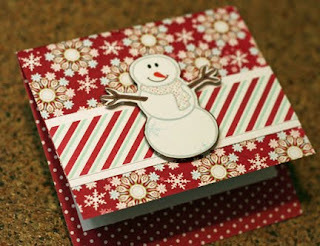 We have a real treat today from Jess...today we will be making an adorable pop up gift card holder! First cut your CS to 4" X 7" and score at 3.5"
Cut your pp to 4.5" X 8" and score at 3.75"
Fold the flap over both sides to make a good crease, and then open up the CS and "pop out" the part you cut out. Adhere the CS to the inside of the pp. I find it easiest to adhere one side and then fold the card shut to make sure it will fit correctly. Add your gift card to the flap using a glue dot... the gift card will "pop" out when you open the holder! I think you'll agree with me that this is an adorable project! Do let Jess know what you think too in our comments section! 1. 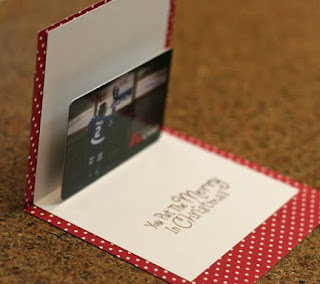 Position the green cardstock in front of you with the 5” edge along the bottom. 2. Bring the 2.5” fold towards you. 3. Then bring the 5” fold towards you. This will make a long base with a triangular fold on top. 5. Glue the 4 ½” x 4 1/2 “ piece of pattern paper on top of the red piece of cardstock. 6. 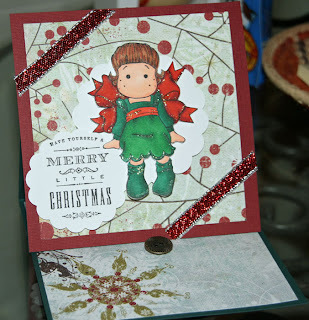 Embellish how you wish – I used a magnolia stamp and a nestabilities scalloped circle with a journaling spot from the December kit to stamp the Merry Christmas. 7. Take the finished front and attach to the smallest fold – the 2 ½” edge, ensuring that both bottom edges are flush to each other. Glue only this front fold of your base to the bottom half of your front piece. 8. 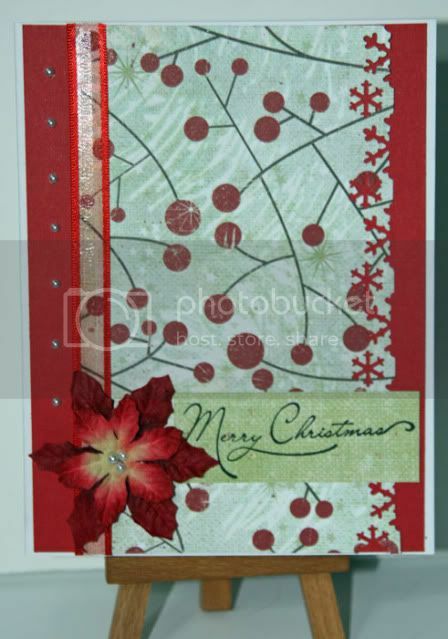 Glue remaining patterned paper piece onto the green to create your base, or inside of card. 9. Attach a button with a glue dot about center so that when you stand up your easel card, it will not slide forward. 10. This card can easily fold flat for mailing!!! Here is the finished card! Isn't it beautiful??? Tammy (aka tampatha)??? Please contact Sandy or myself to make arrangements to claim your prize! Congratulations! Now the everyone has the December kit in their hands it's time to see what you've been busy creating! 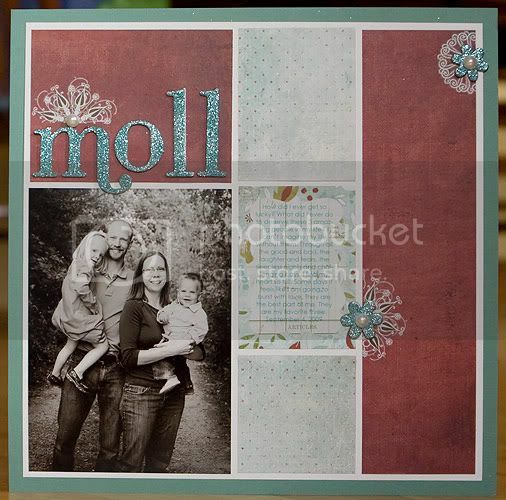 This gorgeous layout by Patti is a great showcase of the kit this month. I love how she used the overlay... and the mix of patterns is fantastic! Let's see what you've done with the December kit! Link me to your "fancy" creations... I'd love to see them! I love Fridays and I especially love Fabulous Fridays! Don't you? This week, we have a Chromotherapy Challenge from Wendy. Her challenge is below. "Can you believe that it is just 2 weeks before Christmas???? My challenge is to create a Christmas Card or layout with red and blue as your main colours...and to add bling -- so red, blue and bling!! I created this card with paper from December’s kit and used my copics to colour the magnolia stamp. This second photo to show how I added dimension. I cut the pattern paper to 5 ¼ x 5 ¼ inches and cut out the middle using my spellbinder die and cricut. Then, out of that center piece, I used the die, 2 sizes smaller to create the inlay on the card. I used foam tape to attach the square to the red background." Please show us what you create and leave Wendy some lovin' in the Comments section! Today we have a delightful dose of inspiration from Amber! She is going to show us how to easily and quickly make a sparkling impression with your gifts this year using supplies from your scrapbook room! Curious?? 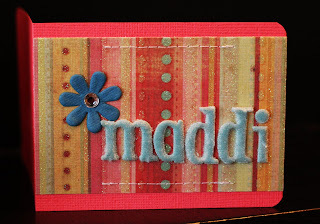 It's a glittered chipboard monogram! It is a beautiful way to personalize a gift. 1. 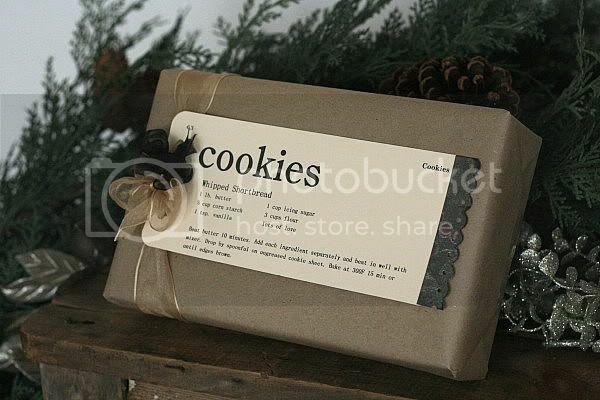 Find the appropriate letter for your recipient in your raw chipboard supplies. 2. Paint both the back and front and allow to dry (I did mine black). 3. Cover the front with glue, sprinkle with glitter and tap off excess. 4. Once dry, pierce a tiny hole in the top of your monogram and use a thread and needle to stitch it to your gift package! You now have a gorgeous, glittery addition to your regular gift wrap in only a few minutes! I think you will agree with me that this is a fabulous project! Please let Amber know too! Please contact Sandy or myself to make arrangements to receive your prize! Today's 12 Days of Christmas inspiration is from Denise. Her daughters like to help Denise make these ornaments. They are in charge of colouring and Denise gets the snowman inside the glass ball. Actually it really isn’t that hard, which is good because “we” are making a bunch for a craft sale this weekend at their school. 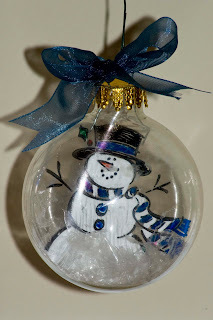 Use a circle cutter to cut a piece of transparency slightly smaller than the diameter of your ornament. 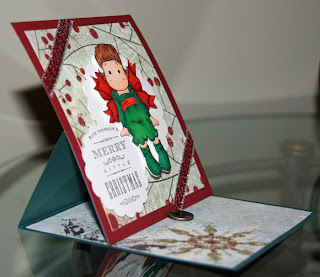 Use staz-on ink to stamp your choice of seasonal stamps – an image or sentiment, both work well. Use sharpies (or other similar permanent markers) to colour on the back of the transparency. This allows you to colour over the black lines on the back but still look good from the front. Punch a tiny hole in the top of the transparency and run fishing line or light thread through the hole and leave about 6 inch tails. You may add “snow” to your ornament at this point, if you wish. Now roll the transparency from side to side tight enough that you can fit the tube in the opening of your ornament. HOLD ONTO THE THREAD! If you don’t you will never get the transparency out again! Once the tube is inside it will open up to show your image. Manipulate your thread tails to better place the image. Place the cap back on the ornament and tie your thread to it to secure the image. Add a pretty bow and hang the ornament on your tree. Here is Denise's ornament - isn't it adorable???? Please let Denise know how much you love her ornament in the comments section! 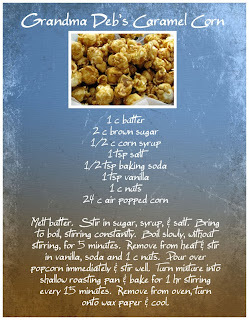 Today we are so lucky to have Jess share a favourite family recipe for Caramel Corn - yum! I have always wanted to make Caramel corn and this is just perfect - thank you very much Jess! How about you? Do you like Caramel Corn? How long have you been scrapbooking? How did you start? 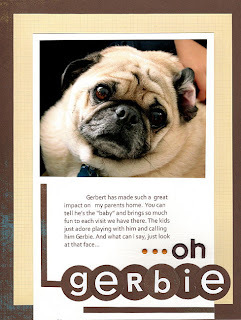 I started scrapbooking way back in 2000 after I was introduced to this wonderful hobby by my sister. I didn’t really have a lot of time to scrapbook as I worked a very demanding full time job and I did a lot more buying of supplies to use in my scrapbooks than actually creating them (although don’t we all? lol) and gave it up completely in 2004 when my oldest son was born. I then came back to scrapbooking again in 2008 and haven’t looked back ever since. This is a tough question because I really want to say “everything!” Colors, patterns, textures, magazine ads, commercials, songs … you name it and it has probably inspired me in some way. When it comes to actually sitting down and creating a layout my biggest inspiration is usually the pictures I am using and the story I want to tell. Those two elements help direct the “feel” of my layout and everything else falls into place from there. When do you do the majority of your scrapbooking? Most of my scrapbooking is done at night after my two boys are in bed but I have to say now that my oldest is in kindergarten and my youngest is in preschool I’ve been able to sneak in a few hours in the mornings here and there and I LOVE it! Do you prefer single or double page layouts? What type of cards do you enjoy making? What sizes do you primarily scrap? I primarily scrap 12x12 but I definitely have my fair share of 8.5x11 layouts in my collection as well. I don’t like to feel restricted by a given size so if I think a layout will work better in one size than another I go for it! Eek! This is always such a hard question for me to answer since my “style” sometimes depends on the photos I’m scrapping or the papers I’m using. I’ll tell you what I love – I love clean lines, bright colors, and fun patterns. I love lots of texture and dimension on my layouts with “just the right amount” of embellishments. I also love to sew on my scrapbook pages either with my sewing machine or by hand. How do you organize your albums? Very simply – by year. I like to skip around when I scrapbook so the easiest way for me to get my layouts in an album is to categorize them up by year. Easy peasy. 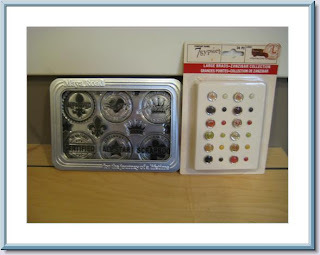 If you had not discovered scrapbooking, what would your passion be? Well I love to garden and I also love photography so if I had more free time (i.e., time not spent scrapbooking) it would be devoted to those two hobbies. What do you love about your scrap space? What would you like to change? My scrap space is the bonus room off of my master bedroom. I have to say I am pretty lucky to have a room of my own and love what I’ve been able to do with it in terms of my work island, storage, etc. There’s also a great big picture window at the far end of the room that lets in some great natural light. What would I change? Well a girl can always use a bigger space for more stuff, right? Do you have something scrap related whenever you go? I do carry a point and shoot camera in my purse with me wherever I go since you just never know when the perfect scrapworthy moment will happen. I don’t keep a journal. I used to a long time ago but not anymore. Do you scrap alone, with friends or at a crop? I mostly scrap alone. Occasionally a few friends will come over to scrap or we’ll head to a crop but honestly it’s hard to coordinate schedules since we all have little ones at home to care for. How did you meet Valerie and become involved in Got Sketch? I actually met Valerie through Got Sketch! I took the first Got Sketch? class (Got Sketch 101) that was offered by Val and Janna (Wilson) in the spring of 2008 and we just became friends throughout the course of the class. Val had asked me to contribute to the Got Sketch? blog the summer after Got Sketch 101 ended and somehow we started chatting about me helping out a bit more with the blog, classes, etc. and it all kinda fell into place from there. Can you tell us what you love best about Got Sketch? The sketches! Easy enough answer right? LOL Seriously though, Val’s sketches are just wonderful. Lots of details so you’re not left scratching your head wondering what is supposed to go where but easily adaptable to any style, photos, or theme. Can you share some tips on how to photograph your layout or card? Do you recommend using a flash? Can you give tips on how to edit photos of layouts and/or cards? I use a Mac so I download all of my photos into iPhoto and do a quick initial edit – straightening and cropping. I then open my image in Photoshop and will often correct the exposure, adjust colors (sometimes shooting with no flash in natural light will give a blue tinge to my projects), sharpening, as well as save my images for the web (smaller file size). How do you select contributors? First and foremost we look for contributors whose style we think will translate well using one of Valerie’s sketches. We like to see a good use of photos as well as general design principles. We really encourage our Got Sketch? followers to drop us an email with a link to their online gallery, blog (if you have one), preference (12x12, 8.5x11, or cards). We are always on the lookout for more contributors. What is the format of the Got Sketch classes? All of our Got Sketch? classes are hosted by ning - an online website. Once students register and are approved for a class they will then be able to sign into the site and view all of the class content (as it is revealed), participate in the forum, post in our gallery, and connect with both teachers and other students. Class content is also available in pdf format so that it may be saved to your computer (or printed out) for future reference. Can anyone post to the Got Sketch gallery? Absolutely! We love to see how others interpret Valerie’s sketches so post away! Can layouts based on Got Sketch sketches be submitted for publication? How should Got Sketch be referenced? Per the terms of the Got Sketch? 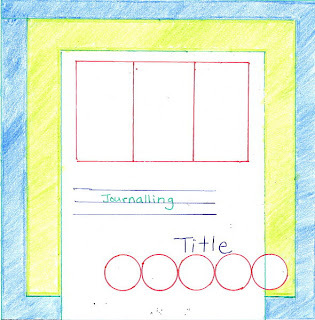 blog Valerie’s sketches are for personal use only and may not be used as reference for publication submissions, contest entries, design team projects, class projects, or other similar purposes. Permission is also required before taking any images from the Got Sketch? blog to post elsewhere (such as your own personal blog, forums, etc). Proper credit for their use in galleries, forums, and blogs is appreciated. These terms vary for Got Sketch? contributors. What is one scrappy goal that you would like to achieve in 2010? Honestly, 2009 has been such an amazing year for me in the “scrapbooking world” so to speak. I’ve been able to accomplish so many goals and dreams such as getting my work published in many of my favorite scrapbook magazines and joining some incredible design teams. I guess my goal for 2010 is just to keep that momentum going! Here is one of Lynn's favourite layouts - I think you will agree with me that it is beautiful! Thank you so much Lynn for your time! OK we're going to take a bit of a break from Christmas this week! We sure didn't see many Halloween layouts come through the gallery this year... so I wanted to share Carolyn's with you today! I just think dressed up pets are so cute! And fabulous pumpkins too! I'd love to see your Halloween layouts this week! Get them uploaded and link me! 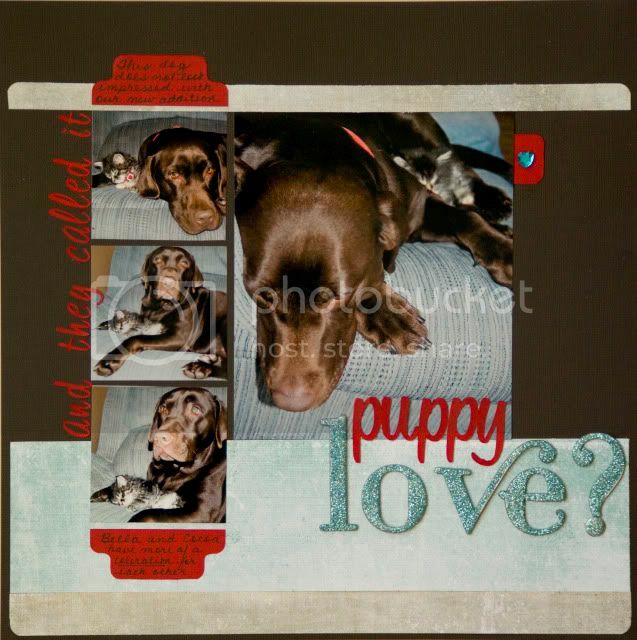 And here is Amber's layout - pretty darn cute I say!!! So ladies...what are you going to do this weekend? I have just the sketch challenge for you - Amber's!!! Please leave Amber a comment about her sketch challenge and an extra link for me when you complete the challenge! “If you’re anything like me you enjoy the traditions of the holiday season. One tradition I grew up with and have carried over into my own family is that of Christmas Crackers at the Christmas Dinner table. It is a non-negotiable staple, and we all have to wear our goofy paper crowns while we dig into our turkey and trimmings. I thought it would be fun to make some Christmas Crackers from scratch. It’s a super easy craft and great for using up some scraps. All you need is a toilet paper roll, some snaps (I got mine at Michael’s) and some paper and ribbon. You’ll also need something fun to put inside, like coins, key chains, hair barrettes, small toys (cars), candy, lotto ticket, etc. To begin, you’ll need a toilet paper roll and a sheet of patterned paper (PP) - thinner is easier. Depending on the size of your snaps and how big you want your crackers to be, you’ll have to adjust your sizes accordingly. My snaps were 10” long so I wrapped my toilet paper roll in a 11"x7” piece of PP. Next trick is to place the snap in the center of the cracker roll so it’s running from end to end. Tie a ribbon around one end of the cracker, just past the border of the cardboard roll on the inside. Here is Jen's beautiful Christmas cracker! I know what I'll be making this weekend; what about you? If your household is anything like mine, these next few days and weeks leading up to Christmas will be brimming with activity, laughs, smiles, anticipation and endless to-do lists! If you were planning to put some special handmade touches to your Christmas preparations but just weren't sure how you would find extra hours in the day, I've got just the thing for you :-) For 12 days in December, the Design Team will be inspiring you with a diverse set of projects that are quick and easy, yes, I said quick and easy to make. We are going to show you how to make items in 30 minutes or less (move over Rachel Ray!!!) with supplies your already have on hand. We may be sharing a favourite family recipe; I love tried and true...or we may show you how to use something you have in a different way. All I can say is, join me for this fun ride! Let's start the 12 Days of Christmas inspiration with my Day 1 project - simple, elegant placecards to adorn your table. In lieu of the traditional tent style placecards, I chose a landscape orientation for my placecard. Inside the placecard, I included a personal wish for each recipient. Here is a close-up of the front. The message is on the inside. Supplies: Bazzill cardstock, Dazzlers flowers, My Minds Eye pattern paper, American Crafts thickers. Are you inspired??? Please leave me a comment. Last week's blog winner will be announced tomorrow! Oh me oh my...you just have to see the cutest and sweetest inspiration from Amber today! Make a sweet impression with your desserts this holiday season by adorning squares, cookies or cupcakes with adorable toppers! Simply search your scrapbook supplies for paper scraps, get out your holiday themed punches or diecutters and combine with a toothpick to create quick and easy toppers! 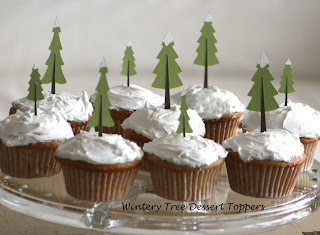 Please let Amber know just how darn cute these cupcake toppers are! Have you seen the December reveal??? OMG...it is stunning!!! Have a looksie at the kit which features Fancy Pants. Grab a tissue ... you'll be drooling over the work of the Design Team this month! What about this gorgeous layout from Heather? I think you will agree...the Design Team has thoroughly outdone themselves! Give them some love in the Comments section, ok?